We are thirteen mothers who have been writing together since October 2002. You will meet us on this blog as we continue to write. Twice a year, we meet for writing retreats usually in the mountains or at the sea. We cry together, we laugh, we eat, we run or walk or swim. We share soup and solace and the words of our hearts. We write together surrounded by foggy mountain skies and the iambic meter of the ocean. Among us, we have lost fourteen children. Without their deaths, we probably would not have known each other; our lives were disparate (and maybe desperate too), yet we have found so much help as we have continued to write. We have found some solace in writing about and sharing our journeys. To celebrate ten years of writing together, we traveled to a château in France—to write. We noted our fifteenth anniversary together with a writing week at Ghost Ranch in New Mexico. The book Farther Along:The Writing Journey of Thirteen Bereaved Mothers was published in summer 2012. We share some of our stories in the book and on this blog. children and wife to an incredible husband, Bud. She is a nurse practitioner whose career took a U-turn after William’s death to cancer at the age of 8. She now specializes in palliative care, striving to ensure comfort to those approaching the end of their lives. She is in awe of her daughter Jocelyn, also a mother of three. She is also proud of her son Brian, who was 13 when his brother died. Read posts by Barbara here. Beth Baldwin’s 26-year-old son died in July 2000 after fighting melanoma for eight months. Branner was a senior in college, had just bought a new house and was looking forward to the rest of a long life. In honor of Branner and his courage, Beth and her husband Sandy devoted nine years to establishing a hospital hospitality house in Winston-Salem, NC. SECU Family House is a beautiful 45-guestroom facility that provides lodging and caring support for families enduring a medical crisis. The inspiration for this comfortable refuge came from the Baldwins’ four-month stay at Family House in Pittsburgh, Pennsylvania while Branner was undergoing a cancer protocol. The Baldwin family, including son Charles and daughter Liz, consider SECU Family House to be a very fitting and special tribute that will help other families who are experiencing some of life’s toughest times. Read Beth’s posts here. See more about the SECU Family House that receives proceeds from book sales at familyhousews.org. Betsy Anderson is a retired school librarian, plays the violin, knits and writes. She has published three books, one of which is a memoir about her daughter, Caroline Elizabeth Anderson. Caroline E. died on February 15, 1995 from meningococcemia. She was sixteen years old. The illness came quite suddenly while she was attending a boarding school one hour from her home in Virginia. Less than twenty-four hours after becoming sick, her parents, Betsy and Rick, were at her side when she died. Her older brother Michael was attending a school in England at the time of her death. Betsy, a spiritual person, still feels Caroline Elizabeth’s presence and influence. In 1998, Kay Windsor read Betsy’s book, Fly On, My Sweet Angel, and contacted her. They became friends, finding that their two daughters were very similar in looks and interests. Kay encouraged Betsy to come to North Carolina to the first writing workshop with Carol Henderson in 2002. It’s a long haul from Virginia to North Carolina, but to Betsy it is worth it to be with other mothers who understand. Betsy is now a grandmother to two grandchildren. Read posts by Betsy here. Beverly Brown Burton lost both of her sons, Wes (16) and Andy (14) in a car accident with Kathy Shoaf’s son, Ryan (15) on March 29, 2002. Ryan’s older brother, Wesley was the driver and only survivor. Beverly and her husband, Blaine made a pledge to one another soon after the accident to live their lives to honor the memories of their sons and to glorify God. Beverly claims that even after all these years, it’s still one day at a time, but she is grateful for each day. She loves sharing stories about Wes and Andy with family and friends and shares her faith journey in inspirational presentations to teens and women’s groups. Beverly loves gardening, walking their family dog Dooley, and decorating. She also stays busy doing volunteer work at Hope’s school and at their church. Beverly facilitates GriefShare, a faith-based program for people who are grieving all types of losses. Read posts by Beverly here. Carol Henderson is a writer, editor, and teacher who leads ongoing nonfiction writing groups and works one-on-one as a writing coach and editor. She has taught around the United States, in Europe, and in the Middle East and has written for many newspapers and magazines. She has edited several memoirs and essay collections. Her memoir, Losing Malcolm: A Mother’s Journey Through Grief was selected as a must-read by USA Today. Her son Malcolm died in 1982. Carol also leads workshops for caregivers and the bereaved. She is currently under contract with Heartland Hospice, training support services staff all over the country to integrate restorative writing into the hospice environment. She started our group in 2002. Read posts by Carol here and visit Carol’s website at carolhenderson.com. Dottye Law Currin is retired from a long career in medical education and health services research which she began only after resolving to live life more fully and authentically after the January 1994 suicide of her 25-year old son, Alex. For Dottye, it has been extremely comforting to be part of a group of mothers who understands that it really doesn’t matter how your child died, rather it is the same, in so many ways, for all who have experienced that loss. Dottye and her husband Walt have recently downsized, giving up the farm life for a more leisurely life in “Mayberry.” They welcome time anywhere on earth with their three grown children and three grandchildren. Read posts by Dottye here. Julie Hester and her husband Dan welcomed premature twin boys into the world in 1997. Four days later they said good-bye to Jack, who died from an overwhelming infection. His brother Hank is growing up strong and healthy, and their family includes daughter Lucy, born in 2000. Julie is a Presbyterian minister working primarily with children and their families. She is grateful for a group of mothers with whom to cry and laugh, doubt and believe, and most of all, write. Read posts by Julie here. Kathy Shoaf and her husband Richard are the proud parents of three children; Wesley, Ryan and Mandy. Their world changed forever on Good Friday, March 29, 2002, when Wesley (16) and Ryan (15) were in an automobile accident with their friends Wes and Andy Burton. Wesley, the driver, was the only survivor of the accident. They credit the grace of God and the love and support of family and friends, in the chaotic years that followed, with helping their family to survive and emerge from this tragedy healthy and whole and with a stronger love and appreciation for one another. Kathy recently retired so they could move closer to their three young grandchildren.This writing group has provided a new family of sisters and a safe place for crying, laughing, writing and comfort. Read posts by Kathy here. Kay Harper Windsor is a retired teacher of high school journalism and English. She is grandparent to six granddaughters and one grandson and parent of two grown sons and daughter Elizabeth, who died in a car crash at age 15. After Elizabeth’s death, Kay lobbied for support for the North Carolina graduated drivers license law that took effect in 1997. “Giving Dreams,” a piece about Elizabeth and driving laws, was published in Keeping America’s Promise to North Carolina’s Children. She leads reflective writing sessions for a community group and for a local hospice. Read posts by Kay here. Kelly Sechrist is a mom to four children, community volunteer, and entrepreneur. She was only 28 years old and pregnant with her third child when she attended the initial writing session that became the Farther along writing group in October 2002. Her daughter, Abigail Faith, had died just ten months earlier of SIDS (Sudden Infant Death Syndrome). Although premature, Abby seemed perfectly healthy until Kelly awoke one morning to find her daughter not breathing. Kelly and her husband David live on the coast of North Carolina.Their three living children are now teenagers who keep the family busy with sports and academic endeavors.They are beginning a new transition stage in life as they sent their first born to college this year. Kelly spends her time serving as a volunteer and board member for local nonprofits, such as the Cape Fear Literacy Council, while running her own company from home. She is passionate about writing, exercise, reading, and helping others.Read posts by Kelly here. Monica Sleap’s 17-year-old daughter Katie, a senior in high school, was killed on February 22, 2001 in a car crash as she drove to school on icy roads. The community’s outcry about the school system’s failure to close schools as the weather unexpectedly worsened prompted Monica’s husband Rick to write a letter to the community urging them not to blame school officials for their decisions about school closings. After Katie’s death, the school system changed its policy on school closings to one more cautious. Monica has worked as a hospice nurse during many of the years since Katie’s death, and her practices of painting, writing and sharing healing laughter have brought comfort in her own grief journey and those of others. Her older daughter, son-in-law and their two sons live nearby. Read posts by Monica here. Peggy Clover’s 18-year old daughter Rebecca was a freshman at Florida State University when she was diagnosed with mononucleosis in November 1996. Rebecca returned home to Raleigh, saw her local physician, and yet died of complications at home in less than two weeks. Peggy was studying art at Meredith College at the time, and she returned to classes the next semester, finishing her degree the same year Rebecca would have graduated from college. She is a multimedia artist and has found great comfort in being able to express her feelings through her art. Rebecca was majoring in psychology, hoping to become a Child Life Specialist working with dying children. Peggy wanted desperately do to something in Rebecca’s honor, but it took nine years before she found a spot volunteering at Transitions Life Care of Wake County in the Children’s Bereavement program. She is also a puppeteer in Transition’s Aarvy Aardvark Finds Hope, a show about loss that travels to third grade classes in Wake County Schools. Her husband and three other children have been her greatest support and source of joy. Though she was a reluctant member of this writing group in the beginning, something kept drawing her to return to each gathering until she could no longer imagine life without the love, understanding, support and laughter of each member. Read posts by Peggy here. Scharme Wigginton Shown was born and raised in Lexington, Kentucky but has been a North Carolinian since 1970. She worked in women’s retail as a buyer and fashion consultant for many years. Scharme is blessed with three wonderful children. Her daughter Leslie lives in Madison, Wisconsin with husband Jon and Scharme’s three grandsons, Finn, Walker, and Lucas, who light up her life. Her son, Marc, an engineer, lives in Raleigh, North Carolina. Steve, her youngest son, took his life on August 23, 1999 at the age of 35. Although his days on earth were short-lived, Steve’s spirit will always remain in her heart. “Today, where I go Steve goes. Together, we will try to spread love and joy to all whom God places in our path, hoping to make someone else’s life a little better each day,” Scharme said. Read Scharme’s posts here. Dottye, Carol, Kelly, Peggy, Kay, Beth, Monica and Barbara at a spring 2018 retreat in Leland, NC. 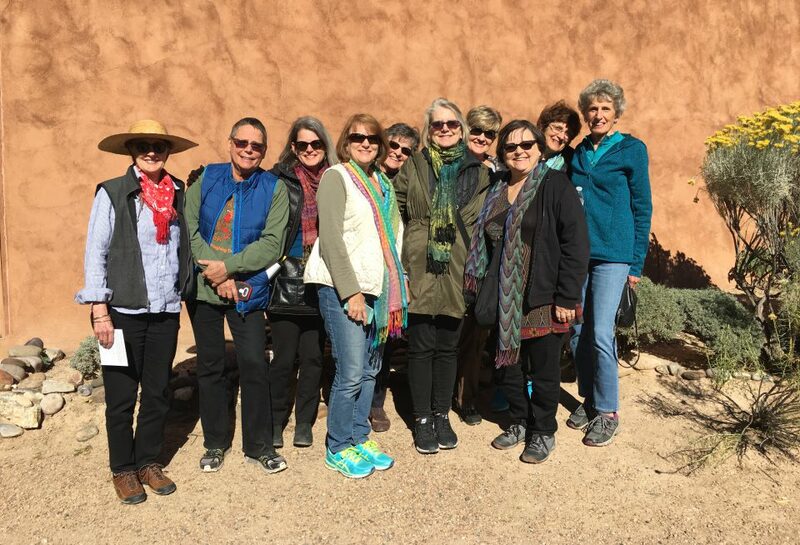 Betsy, Barbara, Julie, Kathy, Dottye, Carol, Beverly, Peggy, Kay, Beth at the Georgia O’Keeffe House tour in Abiquiu, November 2017. Dottye, Julie, Betsy, Carol, Kay, Kathy, Beverly at the Georgia O’Keeffe Landscape tour at Ghost Ranch, November 2017. Missing are Beth, Barbara and Peggy, Monica, Kelly and Scharme. Beverly, Kay, Beth, Julie, Carol, Dottye, Barbara and Bud at Georgia O’Keeffe Living Modern exhibit at Reynolda House, September 2017. Missing are Monica, Kelly, Betsy, Scharme, Kathy, Peggy. Beth, Barbara, Dottye, Carol, Monica, Kay, Kathy and Julie on a mountain retreat in 2016. Summer 2016: Peggy, Barbara, Beth; Scharme, Dottye, Carol, Kathy and Piper, Beverly, Betsy and Kay. Missing were Monica, Kelly, Julie. Summer 2005:Beth, Kay Kelly, Peggy, Dottye, Monica, Scharme (standing); Kathy, Beverly, Carol, Barbara and Julie (kneeling). Betsy was missing from this beach retreat. Scharme, Betsy, Beverly, Julie, Monica, Carol, Kay (sitting); Beth, Peggy and Dottye (standing). Barbara, Kelly and Kathy were missing from this mountain retreat in 2003. Carol, Beth, Barbara, Betsy, Kay and Julie at a mountain retreat. The group at Chateau du Pin near Champtoce sur Loire, France in September 2012. Betsy, Carol, Dottye, Monica, Betsy’s sister Kim, Peggy, Beth, Kathy and Kay at a 2013 writing retreat at the beach. We missed Barbara, Beverly, Julie, Kelly and Scharme at this retreat. I take such comfort knowing that there are other women in North Carolina who have stories similar to my own! The grieving journey has been long and difficult one. Writing has been incredibly therapeutic for me as well. Thank you for sharing your stories! I lost my son 6 mos. ago. It is so raw, but reading about the book has soothed me as I read about each lady. I must honor my son and telling our story would such a healing experience. Beverly, I am so sorry for the loss of your son. I do hope that writing about your son, his life and yours will also bring some comfort to you as it has and has continued to do for us. I join Kay in hoping that writing will bring you some solace as will sharing your story with others. I’d very much like to connect with you ladies. I am a bereaved parent also, and authored a book on my life challenges. And blessings and comfort to you too, Karen. Writing through grief continues for us all. Thank you for sharing our blog too. I found my way here at the recommendation of Robin, who is a member of my bereaved moms’ writing group. How lovely to know that there are others finding joy and solace in a similar way. Blessings to each one of you! My tears are covering my broken heart. An 81 year old mother should not have to bury a 52 year old son who died from complications of leukemia. I spent his last month with him in Atlanta and was with him when he passed looking into my eyes. One year has passed and my moments of grief are getting worse. He died May 13th, 2011, one month after his birthday, April 13th. Reading about these amazing women has given me some hope to go on with my life. But how? I am so sorry for your loss. Grief for the death of a dear child is ageless; it doesn’t matter how old or how young we are or how old the child is. What Carol documents in our book is the slow journey thirteen of us have shared for ten years and the comfort we all found in writing, writing, writing about our children. We learned to share that writing with each other, and now it is our hope that sharing these writings more broadly and the prompts we used to write might help others who are grieving the loss of a child. This is the book we wished we had found when our grief was so new. While the pain never leaves completely, we are now ten, twenty or thirty years from the deaths of our children, and though we are not completely consoled, we have received much solace from the writing we have done. We wish that for you too. Yes, I agree with Kay. We share in your grief and hope you can find some solace and healing through writing–and sharing your words–as we have. Incredible book! It will rip your heart apart, yet it leaves a sense of hope and promise of healing, acceptance of what cannot be changed, never being the same but eventually being able to accept and rejoice in other great blessings that will come. Thank you ladies for opening your lives, your hurts and pain, and your journey. What an incredible book (and blog site!) for those who have lost their loved ones and for everyone (ministers, counselors, therapists, friends, family). The book is great for insight. It is an excellent tool for counselors who work with grieving individuals. It is very practical, straightforward and applicable to many grieving situations. Thank you Monica for placing one of the books in our hands! It is amazing to see how everyone in the group is sharing the responsibilities around the book publication–designing evites and posters and business cards, contacting newspapers and other press, figuring out ways to track book sales, and discussing how to proceed with our events. The book is also giving us the chance to revisit the past with a fresh perspective–a written tribute to our children and each other. For me, the gifts of this group keep on giving. I am amazed and so grateful. I just finished your book. I couldn’t put it down. I’m glad that my mother got involved with this group. I have just finished reading the book. I could not put it down. Thanks to this group for helping our daughter get through a very difficult time in her life. You are all in our thoughts and prayers. I am an Aunt to Barbara Goldsmith of Winston Salem, N.C. and I have just read your stories. I look forward to the book’s publication in August. I have a friend here in Beckley, WV and she lost a daughter in a car accident. I suggested this book to her. Your work will be rewarding. Thanks for sharing with the world your story. Yes, Farther Along: The Writing Journey of Thirteen Bereaved Mothers was indeed published this past summer. Continue to view the blog to see updates about book events. Farther Along: The Writing Journey of Thirteen Bereaved Mothers is available from amazon.com and other online booksellers and was available for purchase at the book launch party August 10 at Community Arts Cafe in Winston-Salem. It is also available for purchase from any of the thirteen mothers now and at SECU Family House in Winston-Salem. See the book on amazon.com. This is a wonderful thing you are doing. Those of us who have lost chidren for whatever reason have to find our own way of healing. Mine has been to be a part of Relay for Life. I can’t bring my son back but hopefully we are making someone else’s life a little better. May God bless you are you move forward!! My thoughts and prayers are with you as you continue to mourn for and to miss a beloved child who died. What a great way to cope and to comfort each other! May God bless you in your endeavors. thanks, Sister, for your usual caring and loving words.